My students and I have been having great discussions around point of view. It began as an assignment in my college course. I had to write a story in first person. I told them I was struggling with it, the idea I had was in third person. This led to students examining the books they were reading to see what point of view they were written in and cumulated in the students writing their own fiction stories beside me, in first person, of course. This week my own college course has moved on, we are now studying third person. Today I was reading my assigned text before school. It indicated that children have a preference for texts written in third person because, according to the book, it is "too difficult for a child to put themselves in the place of the main character" as first person would ask them to do. This, of course, made me pause. Kids are pretty imaginative, would they really struggle with this? And what did my fifth graders prefer? I had to find out. During independent work time today I moved around to survey the kids. I asked two questions - what point of view was their favorite text in and what point of view did they prefer reading on a regular basis. Each class (70 kids in total) said they preferred first person. 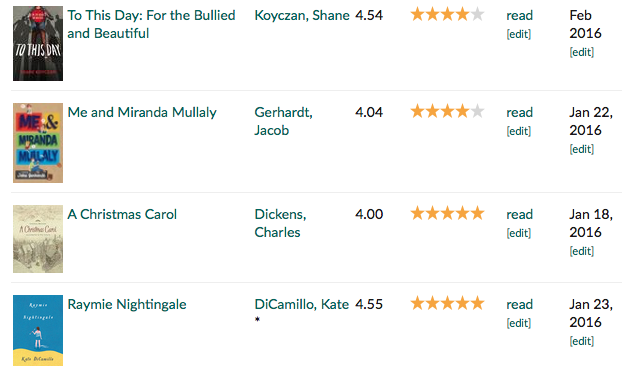 Two of the three classes, however, had more favorite books written in third versus first. Interesting. They had many reasons. By and large they preferred first because they felt closer to the character. In our discussion they came up with a few questions I didn't know how to answer. They wondered what point of view authors preferred writing in and was there a reason behind it? Did book ideas come to authors with a point of view in mind or did authors play around with the idea and figure out what point of view worked best? What, they wondered, made authors write in first versus third, or vice versa? If anyone has any ideas to answer the kids, I'd love to pass your thoughts on. How about you? Do you have a preference for what you read? For me, I am still marveling over Rebecca Stead's Goodbye Stranger - three storylines, three different points of view. Unreal! I can't wait to continue this conversation with my students tomorrow. I'm sure they will teach me something new. I'm a big believer in the power of books. I believe that books can change us. They can make us more empathetic. They can show us lives we never would have lived. As I prepare to turn 42 in less than a week, I know that inside of me I have not only the lessons from my own life, but also the lessons I've gained between the covers of the books I've read. Stories have made me a better person, of this, I am certain. This week I had the great fortune to read four wonderful books, but two of them were books that I will not soon forget. 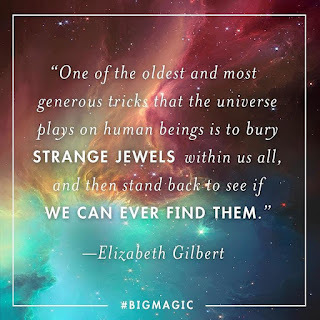 Big Magic was a book on my "to read" stack for far too long. I purchased it, but just hadn't gotten around to reading it. As I blogged just the other day (here), my friend Colby nudged me into reading it, and I'm so glad I did. 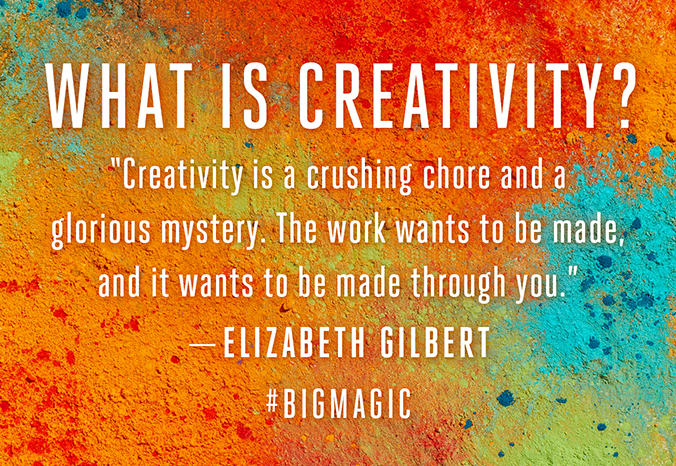 Gilbert reminds me that the act of creating makes me create more. Writing begets writing. I need to make time for it in my life. I need to not worry about the reaction to my writing, because the gift was in the creating. Loved this book. The other book that rocked me to my very core was All American Boys. In a quick summary, this book follows two story lines - Rashad, a black teen, is beaten by a police office who assumes he was stealing a bag of chips at the store. Quinn, a white kid, sees the beating and knows the police office, his best friend's brother. The dual narrative takes us into the minds of these boys. This is a story that I thought I knew before beginning, but I had no idea. I don't know how to even adequately speak about this book except to say that you must read it. Everyone needs to. I have already loaned my book out twice since finishing it last week, it's that good. This book spoke to my soul. It made me angry. It made me cry. We need to have this conversation with our students, we need to have it with each other. Amazing book. Have a great reading week! I'm off to read Gertie's Leap to Greatness. Cannot wait! I'm a big believer in living with your eyes wide open. I think that inspiration can strike at any time, in any place, and you have to be ready to grab it. I've perfected the use of voice texting myself, or leaving messages, on my phone because an idea for a blog post, article, or something will strike when I'm driving. Always. I also believe that the more creative you are, the more inspiration tends to strike. My creative outlet tends to be writing. The more I write, the more I have ideas to write about. 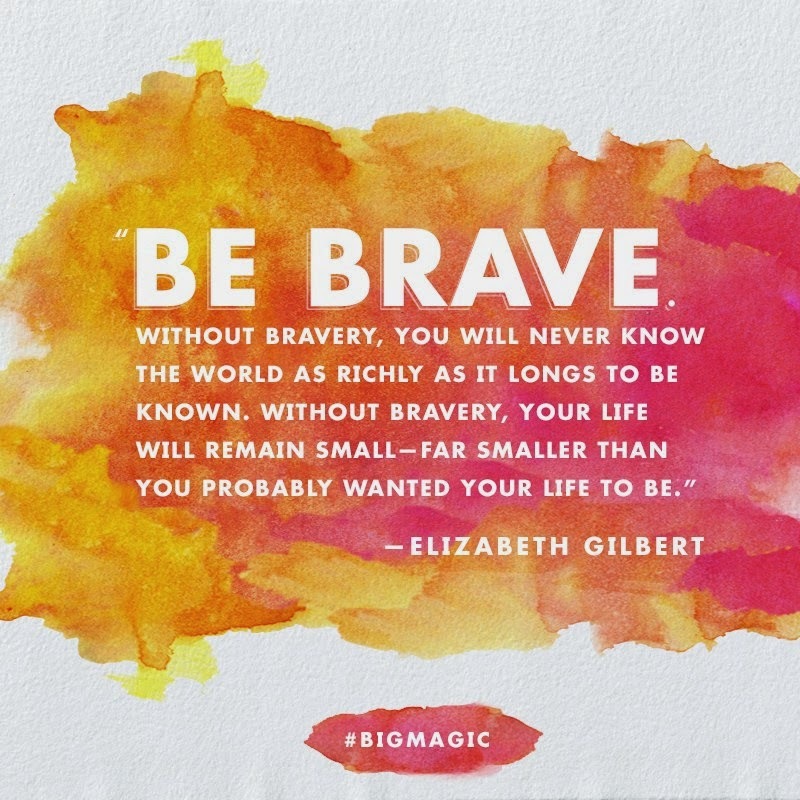 I first came to this realization when I blogged during the March Slice of Life challenge run by the Two Writing Teachers blog during my first year of blogging. (You can learn more about that challenge HERE if you'd like.) I thought it would be an impossible challenge, 31 posts in 31 days, commenting on others daily, but I loved it. Since then I've tried to replicate that for my students. I ask them to write each night. I don't care what they write, just write. They moan, a lot, in the beginning. Some do not rise to the challenge. But many do. Today, pouring over their most recent writing assignment that they turned in, a fiction story from a first person point-of-view, I was simply stunned by their growth as writers. It was unreal. Several of them write better than many adults I know, including me. Inspiration is all around us. I tell my students about where I get ideas all of the time. In our fiction unit, we talked about how I'd sit to write, no idea where the story was going, and let my mind wander. We talked about how I'd get names for characters, eavesdrop on conversations, use parts of people I know all to make up this fictional world. I told them how friends inspire me, and not just as writers. I have friends who I go to lunch with, who push me to be my best self. Friends that make me laugh so much my abs hurt. Friends that push me, sending me messages and gentle nudges to do more, be more. They inspire. Inspiration has been alive in our classroom this week - in the writing we've produced, in the books we've shared, in the conversations we have had. I don't think this is by accident. I think kids need to have these conversations, to realize books don't pop into authors' minds by accident. These authors are living lives open to possibility and when inspiration strikes, they grab it and hold on. All creators are. Our kids can do that too. 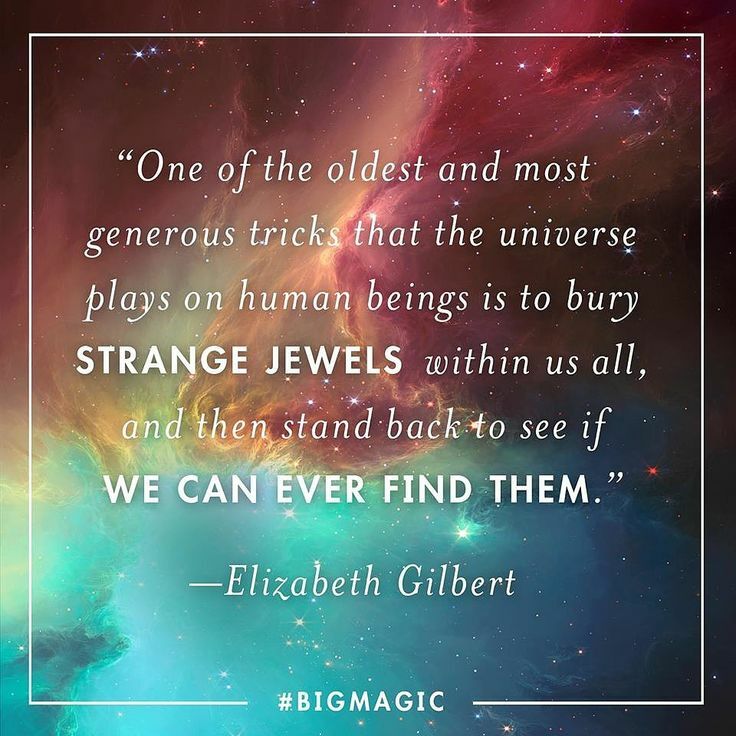 Today I started listening to an amazing audio book that only deepened this belief. I highly recommend it to you if you'd like to live an inspired life, and I'm only an hour in. The book is Big Magic by Elizabeth Gilbert. I know you will love it and be ready to create something yourself when you're done. Huge thanks to my friend, Colby, for pushing me to just read it already. It is exactly what I needed. I am absolutely LOVING my two online classes. One is a Literature course on fiction. I haven't had assigned reading and discussions for such a long time. That being said, it is awesome to talk to others in-depth about books. Each week we have a long essay test where we have to complete a literary analysis of that week's readings. Sharing that assignment with my students, they laugh that so much of what I've been asked to do, they are asked to do. We loved looking at the feedback from my teacher when she references my writing and said "...you do a great job providing evidence for your thinking from the text..." My students laughed and said it was good I could do that well, since I was their teacher. Love them! My English course is Intro to Fiction writing. Wow! I don't think I've tried my hand at writing fiction since middle school? Maybe high school? I honestly can't even remember the last time I was asked to do that. I was so nervous at first. Right now we are writing a piece in the first person. I asked my professor if I could write a children's story. He was fine with that. So I've been sharing a story with my students as I write it. They are asking me to keep going, to write a book. I don't know if it is ok, crap, or has any promise, but man, it's fun! If I can figure out how I can attach a document, I'd be glad to share it with you all. Working on revisions on it today. It's only one chapter long, but I love my characters. And I finally finished my commitment to my state book award committee. We had fifty books to read (but not blog about, or put on Goodreads) and we met this past Saturday. I loved being a part of that. I also loved that I got to truly understand what Teri Lesesne is always talking about when she says "trust the process" in reference to these award committees. It's tough! Just because you love a book doesn't mean it will end up on the list, and because you don't enjoy it doesn't mean you can keep it off. That being said, I can't wait to share with my students what it was like. So much fun to talk books with a roomful of passionate readers. So that wraps up what I've been doing. My reading and blogging will still take a hit, I'd say, until August. I'm taking these two classes until May and two more in June and July. They are helping me a lot to reprioritize my life and put what is truly important first. For that, I am more than grateful! Eddie Red Undercover: Mystery on Museum Mile is the first in the series. I had listened to this one, but had to buy it. When I shared the premise with my students, they were clamoring for it. Basically, Eddie is a kid with a photographic memory who happens to be great at drawing as well. He ends up helping the police department try and bust up a art theft ring by sketching the subjects he sees in museums. My students loved hearing about Eddie and his adventure. Luckily for them, this is just the first in the series. The other two books are both picture book biographies. Hillary Rodham Clinton: Some Girls are Born to Lead had a powerful message for all kids about how our gender shouldn't define what we can achieve. And I knew I wanted to buy Voice of Freedom: Fannie Lou Hamer: The Spirit of the Civil Rights Movement on the day of the ALA awards, it got several stickers. Reading it, I understood why. What an amazingly written story. So powerful. This is one that would be good fifth up. It has strong language and horribly awful scenes of what Fannie had to endure. I gasped several times, and teared up repeatedly, when I read what she experienced. 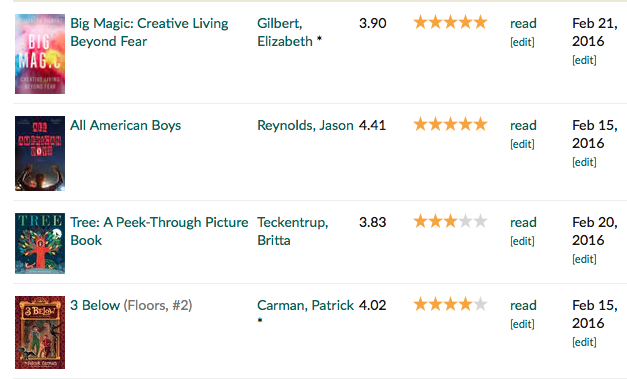 Today I'm reading two books: Three Below by Carman with my ears and All American Boys by Reynolds & Kiely for my book club this week. Thanks, all, for being patient with my lack of updates. It has been a crazy semester so far. 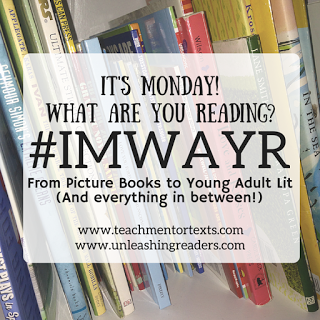 Joining Teach Mentor Texts and Unleashing Readers to celebrate our weekly reading. 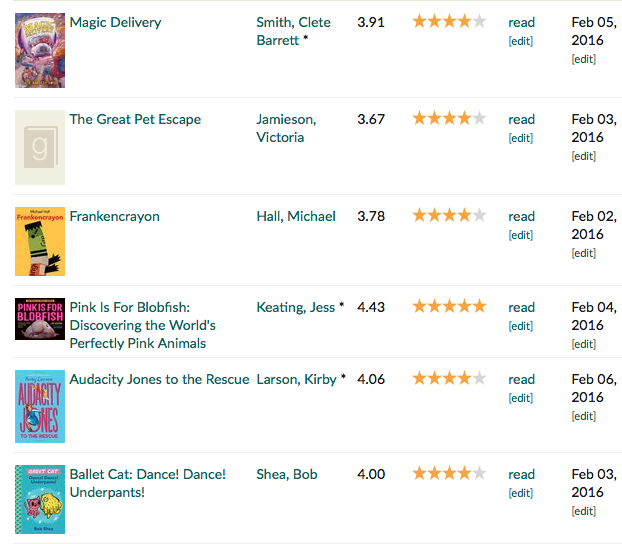 I've had a random reading life of late. I feel at once that I am always reading and I am never finishing any books. I think it is because I'm reading so much for college courses, but they are all short stories and articles, not complete books. I've squeezed in a few books here and there over the past two weeks, as you can see below. Many were fabulous. Hopefully the next few weeks will be filled with even more reading. We'll see. Raymie Nightingale by Kate DiCamillo is one to put on your radar immediately. I hope to review it in depth later, but for now let me just say that you should go ahead and pre-order it. I read it a bit ago. Every line is quotable. I'm currently reading it to my homeroom and cannot wait to see what they think. Brilliance. Audacity Jones by Kirby Larson. Kirby is a genius. I can always count on her for a great historical fiction book. She makes me fall in love with her characters and quickly turn pages to see what will happen next. Here Audacity (an orphan living at a home for wayward girls) is off on an unplanned adventure. She ends up in Washington D.C. involved with a crazy scheme involving the President. Loved this book and I'm hoping it is the first in a series. This week I need to read two more books for a state award and then I'm back to my own reading and I can't wait! No idea what my first choice will be. In this book we meet up with Tuesday again and her mom, who is the famous author, Serendipity. Something horrible is happening in the world. Authors are being kidnapped and turning up in random places around the globe. Tuesday, Serendipity, and Tuesday's dad, know what's going on. Something has happened there - that place that authors travel to when they make up the worlds in their books. Against her parents wishes, Tuesday and Baxterr journey to try and figure out what is happening and how they can stop it. This second volume in the series has simply left me wanting more. I want to know what will continue to happen to these characters I've grown to love (and a few new ones as well.) I hope for the sake of myself and that of my students, that this creative team has many more adventures in store for Tuesday and her friends. 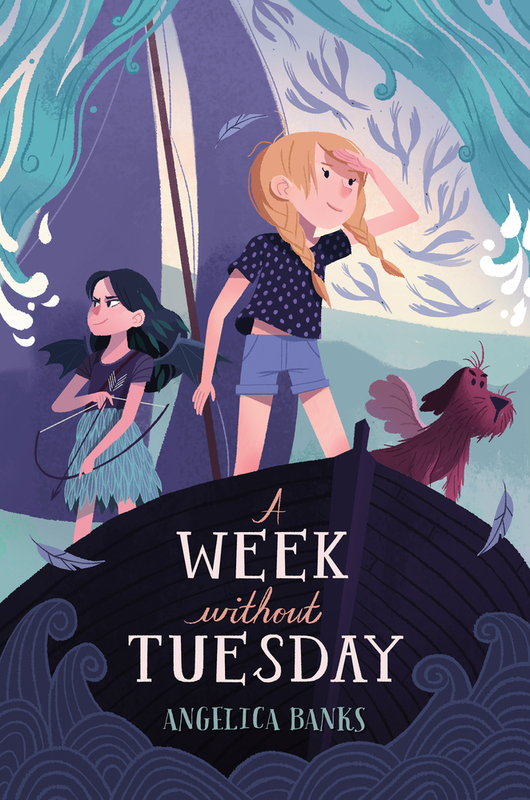 A Week Without Tuesday is on sale today.